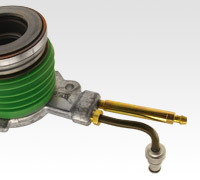 We carry a range of over 700 different clutch master cylinders and clutch slave cylinders. Manufacturers include Lucas, Bendix, Bremtech, AP Lockheed, Bosch and Nipparts. The number of concentric slave cylinders in the car market is increasing considerably. There are now five million vehicles on the UK's roads with one installed. When fitting a new clutch it is essential to fit a concentric slave cylinder at the same time. Otherwise, the vehicle will be off the road again in a few weeks. We stock an extensive range of top quality Sachs cylinders.